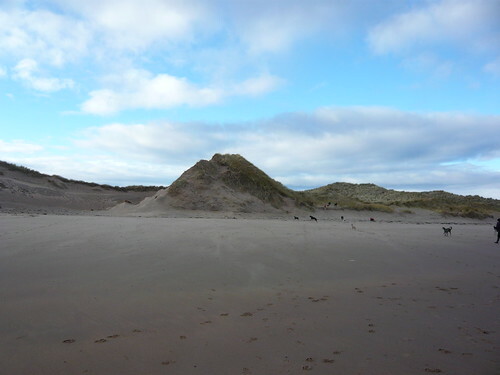 Ravensheugh Sands in East Lothian, Scotland. 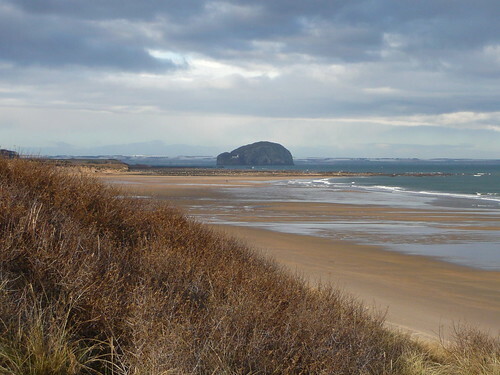 The view below shows the beautiful, unspoilt beach, with Bass Rock on the horizon. Bass Rock is the home of thousands of gannets. An ABC Wednesday post to illustrate the letter R.
I bet the dogs loves this beach. Are they all greyhounds? Jennifer, yes that day we were with the Greyhound Rescue society dogwalk. Oh, this is gorgeous, Margaret! Thanks for sharing these lovely ‘photos! 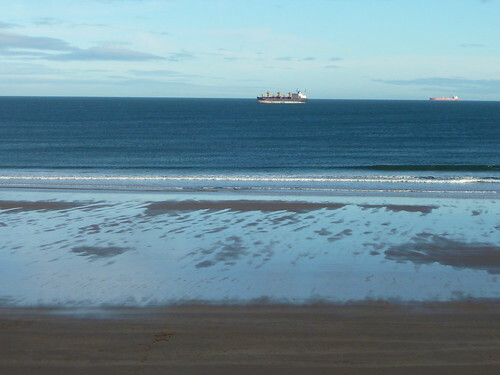 I do love Scotland, and this beach looks like heaven to me. I’ll bet the dogs had a grand time that day; perfect for chasing birds. What lovely photos. Ravenssheugh Sands reminds me a little bit of the Oregon coast. I wish I could go for a long walk on the beach with my dog! 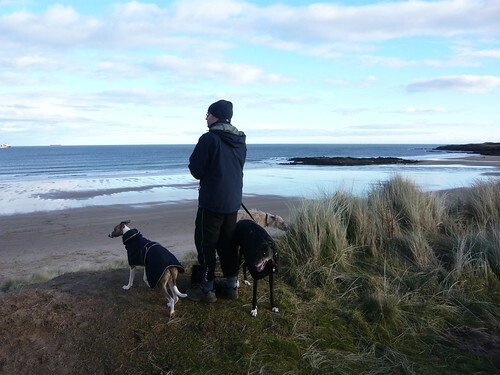 Thanks for sharing these lovely pictures, don’t you just love it when you can get a coastline and beach like this, almost exclusively to yourself? I love walking on firm, damp sand, right close to the waters edge, so that the spray just hits your face gently, so relaxing yet invigorating. I am not a big animal person, so we have never had the excuse of having to walk the dog to get out and about, but I know that hubbie would have a dog tomorrow given the chance. I spent an enjoyable few minutes browsing the site you linked to. The quality of the photography was excellent and some of the images are just amazing. If you get chance check out her latest set of images of the ‘Aurora Borealis’ – Northern Lights – they are oustanding. Such a good site that I have added it to my blogroll, so that I am reminded to visit regularly, so thanks for the recommendation and a lovely post. Lovely photographs, it’s strange seeing the Bass Rock from the other side and I think that’s the Lomond hills of Fife in the background. I want to go and walk this beach! Soo beautiful!!! Years ago I spent a summer in Scotland with a good friend whose mom was from Edinburgh. His uncle took us to Tantallon Castle. It was a beautiful day. We climbed up to the top of the castle (traumatic), put our toes in the North Sea, and had a lovely picnic lunch — his grandmother made a centerpiece for our table (a blanket) out of a coke can and wildflowers. I recently found pictures from the trip and posted them on Facebook. Several of my friends were interested in knowing more about Bass Rock. Is this view from the opposite side? Thanks for your comments – it certainly is a lovely place. Katrina, I think you must be right about the hills in the background and Margaret W. I don’t know Tantallon Castle, so I looked it up and it’s north of Ravensheugh Sands, so you would get a different view of Bass Rock from there. Beautiful sand and sea pictures!! The ships look majestic!! Love watching these impressive beauties!! My R post is here.